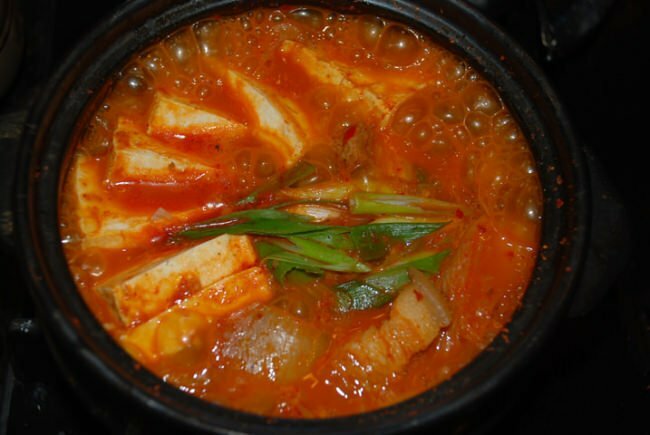 In this post, I’m updating my kimchi jjigae post that was originally posted in September 2009 with better photos and new head notes. 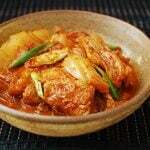 When kimchi gets old, it becomes an excellent ingredient for various other dishes! The most common dish made with aged kimchi is kimchi jjigae (김치 찌개). It’s a go-to stew in Korean homes. 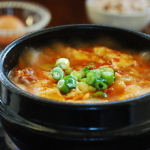 Growing up in Korea, we had a lot of meals just with kimchi jjigae and a bowl of rice. I don’t remember ever getting tired of it. There are many ways to make it. The popular version, which is also my favorite, is made with fatty pork. Kimchi and fatty pork is a match made in heaven. To add extra flavor, cook the kimchi and pork together before adding the liquid. If you’d like, use beef or canned tuna instead. It’s also good simply made in anchovy broth, without any meat, for a cleaner taste. Use the juice from the kimchi if available because it will add lots of flavor to the broth. Whether you make it to use up old kimchi, or to satisfy a craving, this small pot of comfort food is all you need for a satisfying meal. 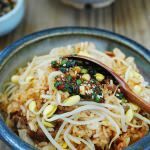 More recipes you can make with old kimchi : dubu kimchi, kimchi jeon, kimchi mandu, kimchi fried rice, kimchi kongnamul guk, kimchi bibim guksu, spaghetti with kimchi and kimchi jjim. 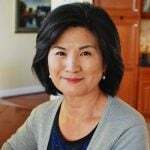 If you want to make some kimchi at home, here are my easy-to-follow recipes: pogi kimchi, mak kimchi, and vegan kimchi. 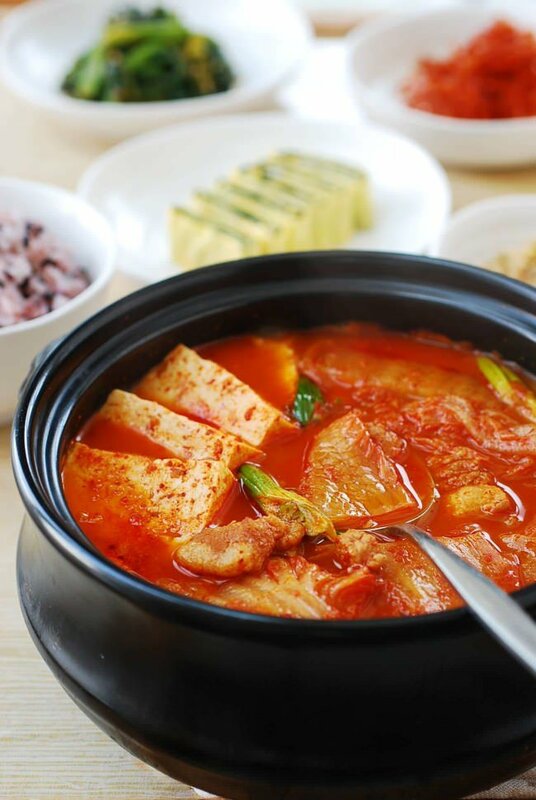 a classic Korean stew made with flavor-packed, old kimchi! Cut the meat and kimchi into bite sizes. 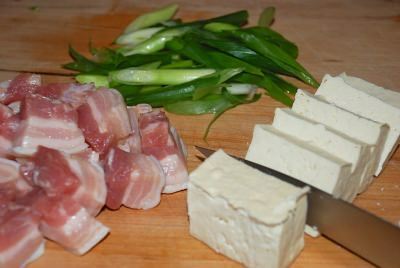 Slice the tofu (about 1/2-inch thick), and roughly chop the scallions. 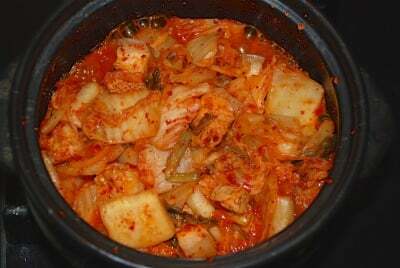 In a pot, cook the kimchi and pork with the red pepper flakes, garlic, and ginger over medium high heat until the kimchi is softened and the pork cooks through, about 5 to 7 minutes. Add the kimchi juice and water. Reduce the heat to medium, and boil, covered, for about 20 minutes. Add more water if necessary. Add the tofu and scallions. Salt and pepper to taste. (Salt is usually not necessary, unless kimchi was lightly seasoned or kimchi juice is not available.) Boil until the tofu is cooked through, about 5 minutes. Serve while bubbling over from the heat. 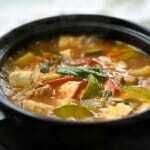 For added flavor, save the water used to rinse rice, ssal ddeum mul, and use for jjigae/stew. 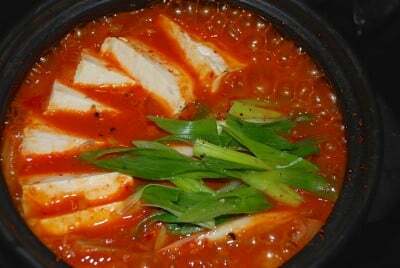 The water used to rinse rice is commonly used for Korean jjigae. I normally use the water from the third round of rinsing. Another option is to use anchovy broth (about 7 or 8 medium dry anchovies and 1 3-inch square dried kelp boiled in 3 cups of water for 10 minutes). 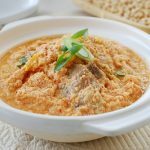 I tried this recipe last night and my husband loved it! He said it was restaurant quality. Thanks. That’s great! I am glad to hear your husband and friend liked it that much! Thanks for letting me know! That’s funny! I am glad he liked it so much. I like to use tuna sometimes, but pork is a definite favorite. Thank you for posting this recipe. I am making it and the taste is great but I find that I am low on broth. Any suggestions as to what I might be doing wrong? Thank you! It could be that your heat is too high. Just add more water, lower the heat, or cook covered. Any of these will help. Thanks! Hello Magalie – I’m glad to hear it works well with canned kimchi also. I’d think many of my other readers would like to know that as well. Thanks for the feedback! Cheers! Looks so yummy… every time I’m on this site, I start drooling. I’ve never been a fan of fatty pork, even though I know it adds great flavor so my mom used to make it, sometimes, with canned 꽁치 and she would add a little sliced potatoes, too. I’m starting to have more old kimchi in my fridge b/c I’m buying larger sizes (my youngest LOVES kimchi). I’ll have to make this and see if she’ll like kimchi cooked. We love canned kkongchi or mackerel version too. Hope your daughter likes kimchi jjigae. I loved it as a child. Thanks! Is it okay if we add no meat or fish at all? Yes, it will still be delicious. Add a little bit of vegetable oil, if you want. 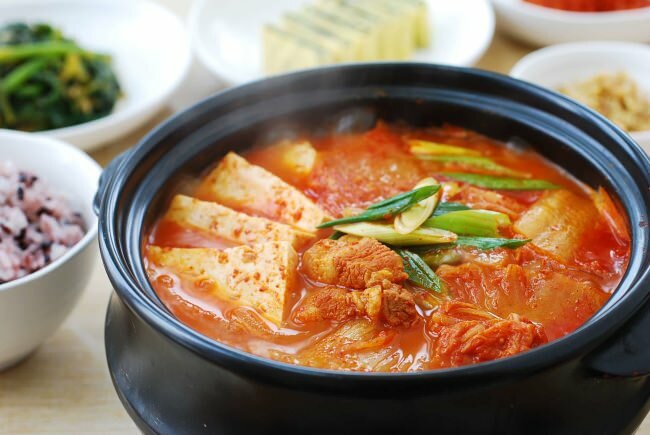 I always order Kimchi jigae when I go to korean restaurants and I always wanted to make it home. What kind of pot should I use? You can use any kind of pot, but a heavy bottom one is good if you have one. Enjoy! Yes, but use more water because you will need to add other ingredients like ham, spam, bacon, hot dogs, and/or vegetables such as onions. You can stir fry the kimchi (and raw pork if using) first and add the other ingredients or put everything together and cook. Hope this helps. I hope to put up my recipe up soon. Thanks! hi, can i not use the gochugaru? or any red pepper flakes will do? 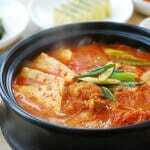 i planning to cook this, sundubu and teokbokki. You don’t have to use gochugaru. Kimchi and kimchi juice should be sufficient. It will just be less spicy. I am so happy you found me as well. Happy cooking!! Hello! I can’t wait to make this. I want to use my crock pot, what is the quantity your recipe serves? I want to make a large amount and freeze for the winter… perhaps I should double it? Thank you! Hi Leila – It’s probably 2 to 3 servings depending on the portion size. Enjoy! I love this recipe so much, I’ve made it several times and it always turns out delicious. Can this be frozen? I’d love to include this for my soup swap! The texture of kimchi may alter a bit. I’d suggest you keep it in the fridge. It will keep well for a few days if you need to make it ahead. Where has this site been all my life???? Haha I am glad you’ve found it! Enjoy!!! Thank you for your recipe. This came out great! Hi. I bought Assi Brand chili paste made by Korean Farm inc out of Korea. The Asian grocery store did not have the Korean pepper flakes. Can I use the paste in place of the flakes. Thank you very much. Thank you; your recipes are really just like what I ate in Korea while I was in the Army at my friend’s house. Real Korean home cooking at its best. Easy-to-use recipes. Again, thank you. 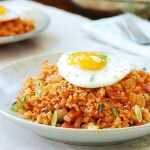 Can I make it without the red pepper flakes and use gochujang instead? You can simply omit gochugaru. Use more kimchi juice if available. A little bit of gochujang is okay too. Enjoy! Hello! I would love to try this recipe but I’m not sure where to find pork belly near me. What other kind of pork can I use? Any pork part will be okay, preferably with some fat. Pork ribs are great too. You may want to boil the ribs and then add kimchi. Hope this helps. Hi Hyousun. Ive made this meal like 5 times already. Its very nice and I love it especially in the winter or on the rainy days. It warms my heart. Thank you for creating this site. Have a nice day. 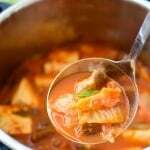 I love kimchi soup…it’s so versatile! I add whatever meat I have on hand, but I definitely agree that pork gives it the best flavor. A lot of recipes call for adding sugar, but I don’t. My husband likes a touch of sweetness to it, so he often adds hoisin sauce to his. Like your suggestion, I often cook the meat and kimchi together before adding the liquid, but I also sometimes add the tofu at that step as well to give it a bit more flavor and texture as well. I also like to add dices zucchini and shredded carrots, and I often substitute broth for about half of the liquid. I’ve only been dabbling in Asian cooking for a few months, so I love to try different versions of the same dish, especially this one. I can’t say that doing it my own way has always been a success…there have been some huge failures with other dishes!…but I haven’t gone wrong with this stew yet! What firmness tofu do you use for this? Use what you can find, but Korean block tofu packages are usually labeled “soft (찌개용)” for stews.